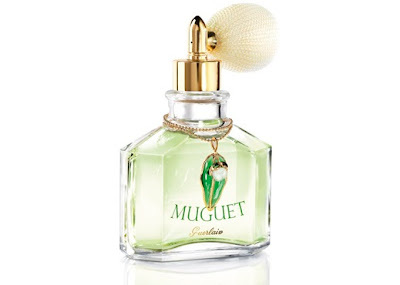 Guerlain is re-issuing their ultra-limited-edition of Muguet perfume, each year with a new twist, for May 1st 2012, celebrating the good luck charm that is lily-of-the-valley given on that day. This year, Guerlain head perfumer Thierry Wasser signs a perfume adorned with a valuable "necklace" from the French house of Gripoix. This limited edition circulates in only 1250 flacons worldwide. Guerlain Muguet 2012 includes fragrant notes of lily of the valley, lilac and rose. The light green juice, symbolising freshness and coolness is held in a bottle that holds 60ml/2oz. The perfume is sold at Guerlain boutiques on April 30th ONLY. 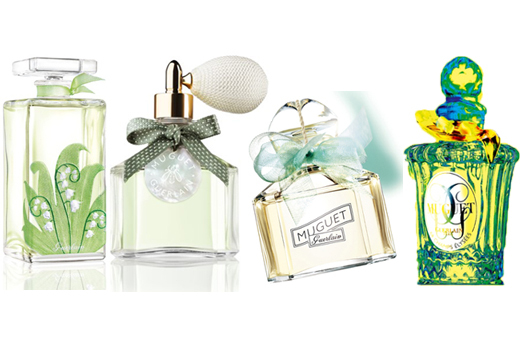 Previous editions of Guerlain Muguet can be seen in this collage photo below.And here is a short guide into identifying the various editions of Guerlain Muguet perfume per year of release. The fragrance itself is credited to Thierry Wasser and -as before- includes fragrant notes of petit-grain, bitter almond, orange blossom, jasmine, sandalwood, gaiacwood, vanilla, white musk and incense. (see the description of Mon Précieux Nectar extrait de parfum from 2009 here). Obviously the 1L parfum idea hasn't gone down as well as anticipated commercially....? Strange...first the math doesn't make sense: the extrait from 2009 was 9$ per ml and now this Parisiennes version breaks down to just 2.16$ per ml. (More of a EDP standard price). A huge difference comparatively, isn't it? Plus all the other Parisiennes are EDP concentration anyway. Why the exception and not encasing it in a different bottle than those, like the quadrilobes or a flacon "petit beurre" etc like the rest of the extraits?? I admit I peaked at the photo but it still doesn't make sense to me. Weird. I'm awaiting for an official confirmation though. Thanks for the post. Would also be interested in hearing whether this is the extrait and, agree, it doesn't make much sense. Also agree a quadrilobe extrait re-release would sell easily. Also Nuit d'Amour joined Les Parisiennes as the EDP, not the parfum. And Mon Precieux Nectar is supposed to be a regular not a limited edition. Just how precious is this nectar, really? Also, does anyone have a price on the year’s Muguet? I was hoping the smaller size would warrant a proportionate price tag, but I’ve been hearing everything from 175 euros (too low! not possible!) to 570 dollars (fuhgeddaboutit!). Love the bottle. Oh, yeah, I can contribute that this year's Muguet is supposed to be lighter and more powdery than the 2011 version. thanks for commenting and for your interesting take. I have searched quite a bit into photos because I was genuinely perplexed myself and came up with a tester bottle photo clearly reading "extrait" (it's the standard square tester extrait style spray flacon). It was put right beside the Parisiennes bottle. This probably indicates that it is indeed the same thing (there would be no reason to have a tester out if the bee bottle had a different thing inside), which is totally weird, but totally understandable in a way as well: the darn thing didn't sell as it was (who needs 1L of parfum? and who has 9000$ to toss for it?) and so they repackaged and resold!!! Uh huh, sorry, doesn't look too good. This arrogance of the industry is what is costing it losses. I have MPN somewhere. It's sugary-sticky and, well, I could have spent the money better. I'll pull the bottle out to check again. And, Muguet. I'm wondering whether I need yet another bottle. Do you know that Lys Soleia is, for me, clearly a reedition (or modernisation) of Voila pourquoi j'aimais Rosine, which was a soliflore lily. That explain why it is so good. Maybe they finally decide to go to their archives!! 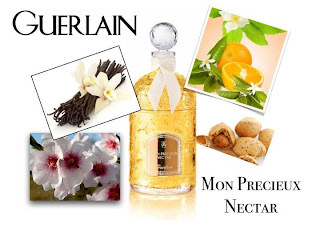 to be totally honest, although each and every Guerlain launch is of interest to me, I always considered MPN the height of kitch as a concept: 1 L of pure parfum!! As if it were meant for a Poppaea Sabina bath or something! There's something inherently crass in such abundance, isn't there? It detracts from the merits of the scent itself. I haven't tried Lys Soleia yet, as it hasn't reached our counters yet (any day now), but if indeed it approaches the archives, I'm psyched. What an encouraging thought!! I've heard good things from my reader Enrique too about LS and he has a good nose for Guerlain. Thanks for adding your own input on this. Only 1250 flacons worldwide and decorated with a valuable Gripoix bauble...I can only imagine the price tag on this bottle! One for the collectors. To be honest, I was not overly impressed with last year's Muguet. It's not Guerlain's fault; the IFRA restrictions have resulted in LOTV perfumes that are less realistic than ever and that rely more on jasmine and other notes to compensate. I absolutely agree with you! This ultra-limited collectioner's type release gets on my nerves most of the time. Instead of appealing, it repels me. Why make something that can't be enjoyed again and again? It's also a very good excuse to make mediocre things, secure in the knowledge that they will be sold due to novelty and exclusivity alone, rather than instrisic value. Even if that's not true for all Guerlain LEs, this "suspicion" is in itself a deterrent. Yes, I had seen this on your page. The confirmation comes from a distributor though (HPPV), not Guerlain official PR. I don't doubt them, but...you know. Still, the matter remains (don't you agree? ): what a rip-off that was back then! 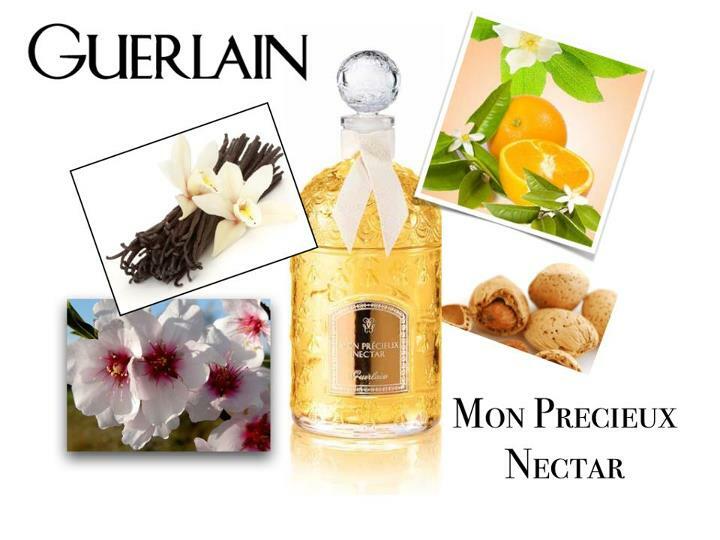 I have linked to his photo of extrait tester in the post, take a look. I'm happy you're happy. It's always a pleasure having you on board. Well, I guess they'd explain it like that. "They argued that MPN 'was light anyway, almost like an EdP.' Not sure if I agree with this. " Ha! I believe YOU, not them. Well, for better or worse I have a bottle of each of these coming to me. The Muguet I just love...and the MPN features two of my most favorite notes: orange blossom and honey...so even with the OTP prices, I just couldn't resist. Fingers crossed. oh, good for you!! Don't let my comment on the price of MPN stop you in any way of enjoying your purchase: I was merely referring to the old price of 2009. This one is supremely logical, especially when extrait! Good for you, honestly, enjoy then in good health! I purchased the 125 mL bottle of Mon Précieux Nectar yesterday and indeed, it is not Eau de Parfum, but Parfum = Extrait. I'm going to state the correct cristallerie.